The American Pharmacists Association is located at the corner of 23rd Street, NW and Constitution Avenue, NW directly between the Lincoln Memorial and the U.S. Department of State. 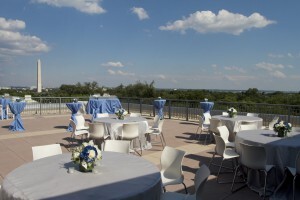 The Potomac View Terrace is located on the 5th floor rooftop and has unforgettable views of the U.S. Capitol, Washington Monument, Lincoln Memorial, Pentagon, Air Force Memorial, Memorial Bridge and the Potomac River. Literally, the best of DC under one roof!